In the digital era, enterprises are seeking to improve their customer experience, loyalty and value propositions by upgrading or replacing traditional technologies and leveraging digital advances such as analytics, mobility, social media and smart embedded devices. C-suite level executives across the globe have realized the enterprises that can enhance the digital customer experience and leverage data insights to optimize their business value chain are gaining competitive advantages over competitors. Enterprises that can digitally transform will increase profitability by speeding up the pace of digital innovation to deliver products and services that connect more closely with customers. Enterprises must first determine the new business value that it wants to deliver to their customers with the adoption of digital technologies. Customer experience should be the focal point of digital transformation within an enterprise. Defining an enterprise's customer value proposition provides the enterprise with a Digital Vision, which describes the business goals which the enterprise is striving to achieve. This digital vision leads to the formulation of the Digital Strategy, which explains how to realize these business goals within the enterprise. Digital Transformation encompasses realignment of the workforce, business process and technology stack with the enterprise to fit the proposed digital strategy. Establishing digital initiatives as a C-suite priority: Digital transformation should be established by top-level decision makers for an organization. Leaders should then disseminate the initiative through periodic seminars, webinars and discussion forums across an enterprise to inform employees how digital technologies can propel better customer experience, improve profits, enhance return-on-investment and foster company growth. Imbibing a customer-centric organizational culture: Leaders should induce a culture into the very DNA of the organization that the customer and an improved customer experience is at the center of the organization's goals, with digital transformation and digital initiatives serving only as a driver to achieve that goal. Promoting cross-functional collaboration internally and externally: Executives can implement an efficient digital transformation by moving away from silos, breaking down any operational barriers that exist across teams and ensuring seamless collaboration across all business units within the enterprise. Enterprise should collaborate with external strategic partners, who can aid in its digital transformation by bringing in a fresh perspective, new design thinking, adding new sales channels for the new digital offerings and set of other skills that add value to the organization. Customer-centric Business Process Optimization: Enterprise should optimize or transform its existing business processes into goal-oriented business processes - with customers in mind, on a macro level by performing a thorough analysis of the customer's digital journey. Holistic approach for Business Process Optimization: Enterprises need to map, connect and optimize the business processes existing within various departments of the enterprise to develop augmented ‘holistic' business processes spanning across the entire organization. Building integrated data management platform and applications: By integrating data across different departments/business units within an enterprise, the collated data can be harnessed for further data analysis on consumer trends. Integrated data management platforms aid enterprises to have all its data to be cleansed, contextualized and governed by data quality standards. Enterprises with integrated data management platforms are able to engage in more powerful analytics strategies. Building advanced predictive data analysis platforms: Having an integrated data management platform coupled with a powerful data analytics platform within an enterprise is always a strategic advantage over its competitors. Enterprises should conduct holistic, multi-dimensional and predictive statistical analysis of relevant structured and unstructured data to understand their customers' implicit and explicit needs to drive customer-focused solutions and products. Predictive data analysis assists enterprises to make more informed decisions and enables them to react more quickly to changes in their business models and operations. Building artificial intelligence and cognitive computing platforms: Artificial intelligence and cognitive computing platforms enable enterprises to automate a significant portion of "knowledge and judgement" oriented tasks across the organizational structure. These platforms harness the technique of deep reasoning connected with the amazing amounts of computer power and data. These platforms aid enterprises to extract meaningful and actionable intelligence from ever-increasing quantities of aggregated data within an enterprise. With artificial intelligence and cognitive computing platforms in place, enterprises can further leverage its workforce to perform more critical functions such as increasing profitability with accelerated speed-to-market solutions, discovering new customers and markets, retaining existing customers and eliminating process inefficiencies. Enterprises can build self-assessment tools applicable to their business models to assess the digital maturity of the respective enterprises against these measurement areas. This self-assessment tool typically includes a survey structured around these themes, wherein the enterprise is ranked in an x-point scale against the questionnaire. There are also digital assessment tools readily available in the market from solution providers like Adobe, Deloitte and Forrester. This assessment will allow an organization to evaluate at which point it stands in the process of digital transformation, including recognizing strengths and weaknesses that can help or hinder an organization's evolution. 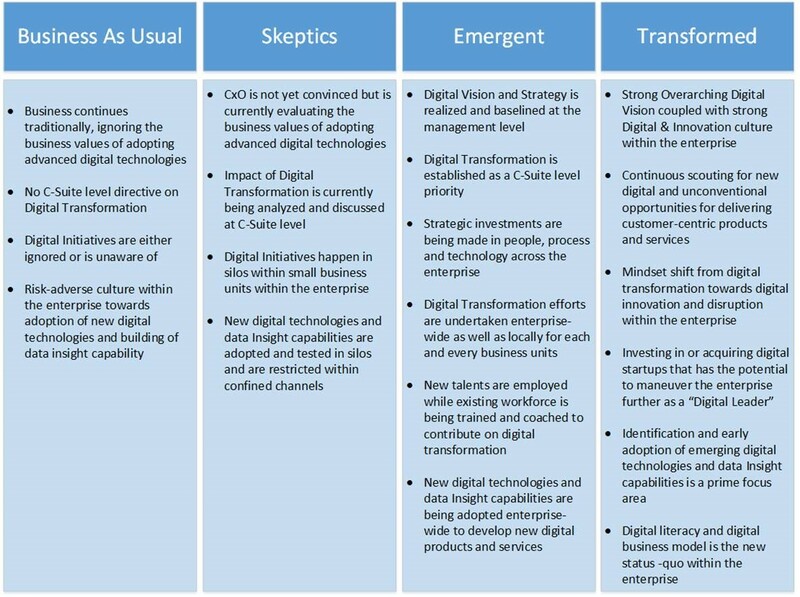 Based on the digital maturity assessment, enterprises should be able to determine if they are a "Business As Usual" or "Skeptic" or "Emergent" or "Transformed" enterprise, from the Digital Transformation perspective (as illustrated in the below diagram). Identifying specific strengths to enhance or weaknesses to tune up will further determine the digital road map for the enterprise. Digital Transformation process within an enterprise will navigate the enterprise to successfully craft a "Digital Business Model" and a "Digital Operating Model", which are the key instruments that will maneuver the enterprise further to be a "Digitally Transformed" enterprise and a "Digital Leader" .